Probably 10 or 12 years ago I participated in a market study. I was paid $50 to sit in a room with a group of other people, mostly women, and talk about clothes. One discussion has stuck with me. The moderator held up a pair of pants and asked us what we'd pay for them. At the time my business wardrobe consisted of nice dress pants and blouses and a few suits for when the customer was in town. The labels in my clothing were Liz Claiborne or Jones New York. My price point was around $70-$90 for pants. I was shocked when one woman said she'd pay $15...and many others in the room shook their heads in agreement that they too thought $15 was a fair price. 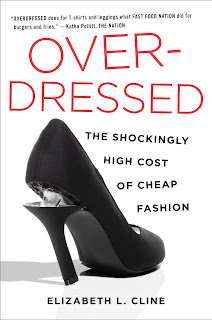 I'm currently reading the book Overdressed: The Shockingly High Cost of Cheap Fashion by Elizabeth Cline. Although I had an idea of what's been happening to clothing and fashion over the years, I really did not realize what's been going on. I'm only on the first chapter and already felt compelled to blog about it. 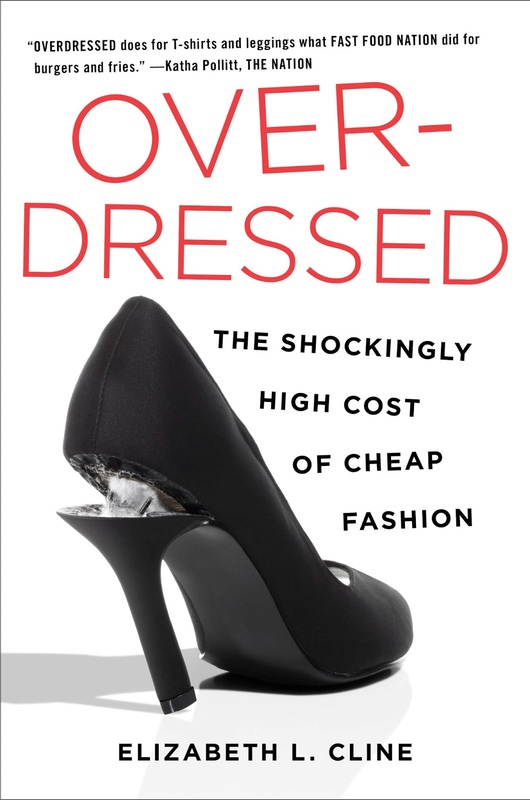 I do not buy (many) cheap clothes and I avoid H&M, Zara, and Walmart, so I was not aware that today one could pay even less than $15 for pants, dresses, blazers, and shoes. Maybe it's because I sew, or maybe it's because I never got into shopping with my girlfriends or maybe it's because I have difficulty finding clothes that fit right, but I pretty much dislike clothing shopping. I was aware of the developing trend for large quantities of cheap clothing around 20 years ago. At that time I was a grad student on a very tight budget. I went on a trip to Germany and Austria (thanks to the deep pockets of my then boyfriend) and got a glimpse of how expensive clothing was in Europe. Maybe it was because I was in touristy towns, but I saw that clothes were sold in small stores at relatively high prices. But I also got the sense that because of the cost, the clothing was purchased wisely, worn often, and cared for. I returned home to find that a new discount store opened in my town with rack upon rack of generic clothing in a variety of colors and at a very cheap cost. I realized then that Americans could (and would) purchase clothes without much thought and because they were so cheap it wouldn't matter if they weren't worn or became misshapen rags after one washing. Even though I didn't have much money, I decided I'd rather live like a European. The problem was that even if I saved my money, quality clothing was disappearing from the stores. I purchased my Liz Claiborne and Jones New York wardrobe from Macy's but soon I began to hate going there. The dressing rooms were cluttered with piles of discarded clothes, and the aisles were crammed with racks of generic, cheap clothes. Fortunately I found that because I had purchased relatively good clothes - $80 instead of $15 for pants really did make a difference in quality - I didn't have to shop that often. Then my job changed and I no longer needed suits for customer visits. Casual Fridays became Casual Monday-Thursday as well, and soon I was the "best dressed" engineer in my workplace when I wore pants that weren't out of denim. My wardrobe consisted of either clothing I sewed myself or sweaters, blouses and pants I picked up at Costco along with 2 gallons of milk and 24 rolls of toilet paper. Once or twice a year I ventured to the mall department stores to treat myself to a new outfit. I would succeed at finding a few things, but usually the day was long and frustrating because I was dismayed at the quality and trendiness of the clothing, lack of any sales help, and inability to find clothes that fit and could be worn for more than a few months. Now that I'm in Germany I would love to say that I'm living like a European, but I fear that this now means buying cheap clothing, for the most part. When I walk downtown I pass many stores with racks of 10-euro tops - flimsy things that wouldn't last beyond one washing (and certainly not the 2-hour wash cycle of European washing machine!). Truth be told, I haven't done much clothing shopping here, except for winter coats and ski jackets, but when I do, I won't be visiting H&M or C and A or browsing the racks of those cheap 10-euro tops. Thankfully there's no Costco here to tempt me with the convenience of buying clothing with my groceries. I brought my sewing machines, there's a fabric store just a 5 minute walk from my apartment, and I have Burda magazines.